There’s a Plymouth Colt that lives in my neighborhood in Brooklyn. The name alone should tell you how old it is, and what it is—a miserable shitbox of a car from the 1980s. I don’t know how long it’s been living there, since at least 2003, I’m told, but one thing is for sure: it’s a survivor. A car like that probably wasn’t meant to last forever. Boxy, but not in a charming way, it’s the kind of economy car that used to exist but doesn’t anymore. It has an underpowered engine, ugly cloth seats and probably a not-great gearbox. It may be fun in the way that any car is fun if you slide it around the dirt in an attempt to take it to the edge of death, but actually driving it doesn’t sound very appealing. The fact that someone has kept it running since the Reagan administration, and street-parked in one of America’s most car-abusing cities since God knows when, is quite amazing. And it’s also a sign of how far we’ve come with small, affordable cars. If you want an indicator of how great modern vehicles are, don’t drive something like a McLaren. Skip the Porsche 911, and any other letters or numbers you want to tack onto that. Ignore Tesla. What you need to do is drive a Toyota Yaris iA. On a recent trip through parts of the Deep South with a longtime friend, I deigned to live as the masses do and got a car through an airport rental service, not a fancy media fleet. Our plan was to arrive in Memphis, hang out there for a bit, drive to the blues mecca that is Clarksdale, Mississippi, chill out in Jackson a bit, then loop back to Memphis. I considered renting something like a Mustang or a Camaro—add a bit of fun and excitement to the trip, make it more memorable somehow. But I couldn’t justify spending over $200 for a weekend in either, or the extra cost of gas. Not when we could spend our money on more BBQ and booze instead. So I opted to spend $97 on a car from Dollar at the Memphis airport. And when we arrived we had several choices: a Ford Fiesta, a Toyota Yaris hatchback, a Nissan Versa, a Kia Forte, I think, and the Yaris iA. I immediately and aggressively jumped for the Yaris iA, and I’m glad I did. “This,” I eagerly explained to my more normal, more well-adjusted, less car-savvy friend, “isn’t a Toyota. Through the miracle of global brand partnerships, it is actually a Mazda. That means it should be a bit nicer and a lot more fun to drive than a lot of mainstream cars are.” Our own Stef Schrader gave the re-badged Mazda 2 high marks earlier this year but this was my first time behind the wheel, and it exceeded my expectations. Cheap compact cars get such a bad rap from everyone, thanks in no small part to penalty boxes like that Colt. Everyone wants size they don’t need. 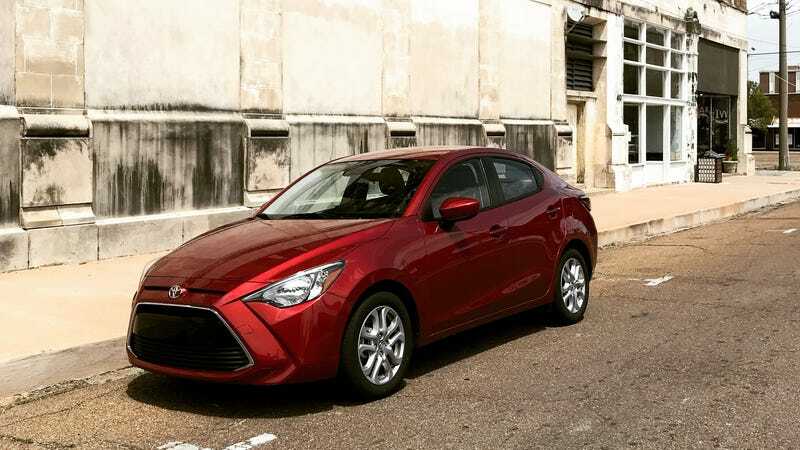 Everyone wants an air of opulence, an image of rugged, outdoorsy individualism, and they wreck their bank accounts for crossovers they don’t need when something like the Yaris iA will get the job done just fine. Hell, better than fine. Though the specs are humble—front-wheel drive, 106 horsepower from a 1.5-liter non-turbo inline-four, torsion beam rear suspension—the iA consistently impressed me with how fun and capable it was to drive. No, it’s not fast, but wring it out and it moves just fine, certainly better than most economy cars down through history. The handling was pretty delightful for its simple setup, with quick and darty and direct steering. The Mazda-sourced infotainment system didn’t have navigation (we used our phones instead and charged them with the in-dash USBs) but it did have Bluetooth audio and calling. And it had more than enough trunk space for two guys’ weekend gear and all the stuff we bought along the way. The ride was comfortable, too, smooth while being sporty and never harsh on the hundreds of miles we put on it. It was perfectly livable on highways and battered roads along the Delta, and even fun in the occasional corners I could find. The iA also had that plucky, fun character that’s hard to put into words—it was just an enjoyable, willing, capable road trip partner, even when it was far from the fanciest car on the road. Great on gas, too. But as I mentioned earlier, the iA served to me as the ultimate example of how good modern cars can be. We enthusiasts are given to blind nostalgia quite a bit. We don’t always appreciate how a $16,000 sedan has space, a suite of airbags, ABS, traction and stability control, great fuel economy, enough tech features to keep you entertained on a long drive, tons of comfort and more than adequate power. A car like this gets lost amid the insane horsepower wars, but it’s significant in its own right. Not long after I got back, it came out that Ford was killing off pretty much all of its cars except the Focus Active—itself a faux-crossover aimed at stealing sales from Subaru—and the Mustang. (Let’s be thankful for small favors on that last count.) This got me thinking about Ford’s own Fiesta, a car I always liked, and cars like the iA. It’s a shame that the crossover explosion means we’re losing cheap, dependable, small cars, the kind ideal for a first driver or a family on a budget or someone on a trip after a rental that isn’t miserable. Because some of these cars are better than they’ve ever been.